In preparation for this report to the USAHA Committee on Poultry & Other Avian Species, the subcommittee chairman, Dr. Clark, surveyed turkey industry professionals and veterinarians representing (n=23) the US turkey production regarding the health status of turkeys produced in August 2016 through August 2017. The turkey industry reports several disease challenges for this 12 months varying by geographic regions within a state and across the United States. This report will list, Table 1, the challenges by disease and issues. Of particular interest in 2017 are issues with lack of efficacious drugs, colibacillosis, ORT, clostridial dermatitis, coccidiosis, Bordetella, and blackhead. The “lack of approved efficacious drugs” continues to be the top health issue (Table 1). The withdrawal of the NADA (New Animal Drug Application) for enrofloxacin in 2005 for use in poultry leaves the industry with no adequate therapeutic response to colibacillosis (ranked #2, up from #3 since 2009-2015), or fowl cholera (ranked #12 from #11). In July 2011 the sale of roxarsone was suspended; September 30, 2013, the FDA marketing authorization NADA was withdrawn. The sponsor of Penicillin-100 Type A medicated article (in feed administration) withdrew the approval (NADA) June 30, 2015. Nitarsone (see blackhead) approval was withdrawn December 31, 2015. Issues over the use of antibiotics in animal agriculture remains a major concern for the turkey industry and for all of animal agriculture. Clostridial Dermatitis (CD), also referred to as Cellulitis, remains a major disease issue across all geographic regions; as the survey average changed slightly to a score of 3.4 (from 3.3 in prior year) and slipped to a #4 rank (from #3 in 2016 and #2, 2008-2015). CD is most commonly seen in, but not limited to, commercial male turkeys nearing market age. Clostridium septicum, C. perfringens type A, or C. sordelli is isolated from fluid or affected tissue samples of affected or dead birds. Affected turkeys present with two or more of the following clinical signs: subcutaneous emphysema (crepitus); serous or serosanguineous subcutaneous fluid; vesicles on the skin, especially on the breast/inguinal area; moist, dark, wrinkled skin, especially breast/inguinal area; cellular necrosis (microscopic); organ involvement (spleen/liver); vesicles on the skin, and/or moist, dark, wrinkled skin, on the tail area. The affected flock will have mortality greater than or equal to 0.5 dead per 1,000-birds, fitting the individual bird definition, for two consecutive 24-hour periods. Opinions vary as to risk factors and potential causes of the problem. Some of the key areas to control of CD include: early recognition; removal of mortality 2-3 times per day; medicating affected flocks with appropriate antimicrobials; promptly managing all water spills and wet litter, feed outages and do not compost litter within 200 feet of poultry barn. There has been limited success with vaccinating at-risk flocks with autogenous bacterins and toxoids. ORT (Ornithobacterium rhinotracheale) ranked #3 versus #4 in 2016 (#7, 2015), is a highly contagious respiratory disease in poultry caused by a gram-negative pleomorphic rod-shaped bacterium. It has been isolated from chickens, ducks, partridges, and guinea fowl. It was originally recognized in Europe and South Africa. ORT was first confirmed in the U.S. from turkeys in 1993. Horizontal transmission (such as, bird-to-bird, contaminated people and equipment) by direct and in-direct contact is the primary route of spread. However, vertical transmission is suspected (Hafez, 2000). In the fall of 1995 it was a major cause of respiratory disease in midwestern states and since has become endemic across most of the USA. 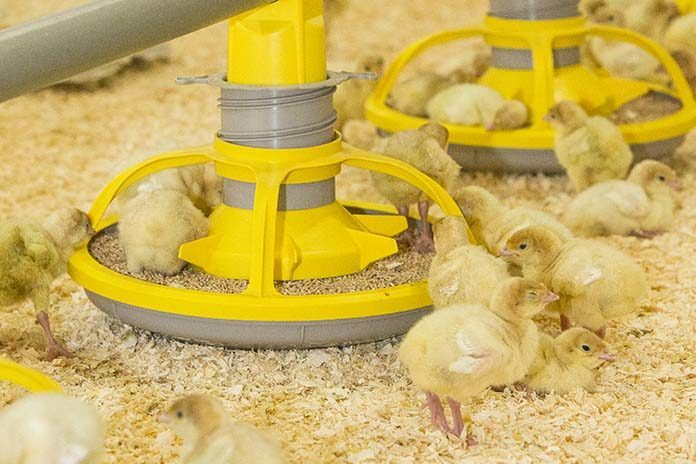 Management systems, such as brood-and-move have increased the exposure of ORT-naive birds to ORT in the finisher barns, resulting in respiratory disease and mortality in some operations. Biosecurity procedures must be taken. Proper water sanitation can minimize the severity and spread. Vaccination is limited and results are varied (toxoids, bacterins). Bacterins are used in breeders. Recently, controlled exposure efforts on individual flocks have shown value. ORT in turkeys is an identified research need. 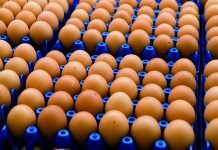 Coccidiosis increased from #13 to #6 most likely reflects the industry increasing raised without antibiotics (RWA) and no antibiotics ever (NAE) market. RWA and NAE programs do not permit the use of ionophore anticoccidials and many programs prohibit FDA approved chemical anticoccidials, so anticoccidial programs consist of alternatives or vaccination. An effective coccidiosis control program in turkeys involves the use of anticoccidial medications and/or phytonutrients (alternatives) and/or live vaccines and the subsequent development of immunity. Chemical anticoccidials account for 33% head and 4.5 months. Coccidia vaccination was limited to 7% head; the low incidence might be in part due to the limited availability of the only USDA approved commercial turkey coccidiosis live vaccine. Nutritional dietary supplementation with phytonutrients (alternatives) is becoming more popular, reported at 14% head, either via in-feed application or drinking water administration. Programs may utilize phytonutrients in addition to the current anticoccidial program, to potentiate the possible benefits. Some phytonutrients have purported activity against coccidia. Phytonutrients may include, plant extracts (yucca, etc. ), prebiotics (beta glucans, yeasts), essential oils (oregano, carvacrol, thymol, cinnamaldehyde, capsicum oleoresin, turmeric oleoresin). Turkey Reovirus Digital Flexor Tendon Rupture (TR-DFTR) was recognized as a newly emerging disease in 2011. A unique reovirus has been isolated and identified as the cause of tenosynovitis and digital flexor tendon rupture in commercial turkeys. Clinical signs in young flocks are reportedly mild to nonexistent, but can develop into lameness and/or abnormal gait in older flocks, starting at about 12 weeks of age. Affected flocks may also report an increased incidence of aortic ruptures and poor flock performance (weight gain, uniformity). Research continues into pathogenesis, virus characterization, diagnostics and epidemiology. Research indicates that the turkey arthritis reovirus is distinct from the recently identified novel reovirus causing arthritis in chickens, and most similar to the turkey enteric reovirus. TR-DFTR was added to the survey in 2011 and ranked #11 (Table 1) with 106 “confirmed” cases or flocks (Table 2). In 2016 TR-DFTR ranked #11 with 182 cases; prior year it ranked #26 with 31 cases. A breeder company has implemented an autogenous reovirus vaccination program to induce the maximum production of antibodies and resulting transfer of maternal antibodies. Historic results originally showed a significant reduction in associated clinical signs in those poults placed from vaccinated flocks. A commercial turkey lighting program of 4-8 hours of continuous dark in a 24-hour period has also been recommended. The combined efforts of breeder vaccination, commercial farm biosecurity and flock management once appeared to be controlling this disease. Increased recognition of TR-DFTR in 2016 – 2017 suggest that the reovirus has again mutated. TR-DFTR is also called Turkey Arthritis Reovirus (TARV). 2) Development of safe and cross protective live reovirus vaccines. 3) Develop a reliable and reproducible model for vertical transmission to enable study of pathogenesis, seroconversion, and persistence. 4) Impact of age on susceptibility. 5) Determine titers needed to prevent vertical transmission. 6) Determine impact of vaccination and exposure on antigenic changes. Blackhead, also known as Histomoniasis, changed to position #8 (#9 prior year; #13, 2015). There were 109 reported cases of blackhead (Table 2) an increase from 101 the prior year, and more than the record 108 in 2010. Histomoniasis occurs regionally and seasonally in turkeys, and can result in significant mortality. Dimetridazole was extremely efficacious and previously approved for use in turkeys for the prevention and treatment of blackhead; it was banned in 1987. The lack of any legal treatment for histomoniasis is of concern, especially in the case of valuable turkey breeder candidate flocks. Losses to blackhead have been severe in several areas of Europe, and sporadic cases are occurring in North America. Nitarsone FDA approval was withdrawn December 31, 2015, leaving the industry with no drugs approved with indications against histomoniasis. Nitarsone was approved for the prevention of histomoniasis (blackhead disease) in turkeys and chickens, and was the only approved animal drug for this indication. Seventy-four percent (74%) of survey reported one or more cases of blackhead. Of the 109 cases reported at least 5% were destroyed to alleviate animal suffering and due to excess morbidity and mortality. Two recent peer reviewed publications of industry, include Clark and Kimminau1 summary of current blackhead situation in the field and also Regmi2 details FDA considerations for antihistomonal drug approvals. Poult enteritis of unknown etiologies has changed in importance, to position #10 from #14. Turkey Coronavirus (TCV), as a defined cause of enteritis, was ranked #31 (Table 1), changed from #32 previously, with 12 reported cases, up from 6 the previous year (Table 2). Protozoal Enteritis, attributed to flagellated protozoa, Cochlosoma, Tetratrichomonas and Hexamita, ranked #12, changed from #17; protozoal enteritis remained relatively unchanged over past years until 2016 and associated with the loss of nitarsone. Several types of protozoa are associated with enteric disease of turkeys. Protozoal enteritis can present with general signs, including dehydration, loss of appetite (off-feed), loose droppings (diarrhea) and watery intestinal contents. Flagellated protozoa include Cochlosoma, Tetratrichomonas and Hexamita. Eimeria and Cryptosporidia are non-flagellated protozoa. Cochlosoma and Hexamita are associated with enteritis, primarily in young turkeys, especially in the summer months. There are field reports of co-infections with Cochlosoma and Tetratrichomonas, or Cochlosoma and Hexamita, or flagellated protozoa and Eimeria. Single age brooding has been implemented during the last several years to assist in managing diseases on turkey farms, especially enteric diseases. Historically, production systems included 2-3 different ages on a single farm site reared in separate barns, from day-old to market age. The trend is to isolated, specialized brooding facilities. All production is separate hen and tom rearing. The brooding phase for commercial turkeys is rearing about 0-5 weeks of age, then the flock is moved to specialty finisher or grow-out barns. Single age brooding may be termed all-in/all-out or single-age or brooder hub. Single age brooding systems can operate in two ways. One option rears the turkeys to slaughter age at the same farm site, without other ages on the farm. Another system of single age brooding involves farm sites dedicated to brooding, then at 5 weeks of age birds are moved to a separate site for finishing; some systems may move birds 0.25 miles up to 20 miles away. In 2017, 63% of brooding was single age, compared to 39% in 2009. Single age brooding is more common in the Southeastern US than the Midwest states. Conversion to single age brooding started in late 1990 following the emergence of PEMS in North Carolina; advantages became obvious and it has expanded to other areas of the US. Tunnel ventilation of finisher (grow-out) barns is becoming more popular method to minimize heat stress; in 2017, 29% of the industry finisher production is tunnel ventilated, compared to 12% in 2009. Late mortality ranked #14 health issue and changed from #7 the prior year. Late Mortality may be defined as mortality, in excess of 1.5% per week, in toms (males) 17-weeks and older; mortality is not diagnosed to a specific disease or cause. Excess cumulative mortality of 5 – 10% in toms prior to slaughter has been reported. Late mortality may be associated with physiologic or biomechanical deficiencies following early rapid growth in heavy toms achieving genetic potential; aggressive behavior noted in mature toms; cannibalism; leg problems and/or hypertension. Leg problems (#6, prior year was #5) are ranked among the top concerns of the turkey industry. Leg problems are a common complaint, such as, spiral fractures of the tibia or femur. Leg Problems may be defined as lameness, particularly in toms, several weeks prior to slaughter. Leg problems are attributed to various conditions (refer to Table 1), including, pododermatitis, fractured femurs, fractured tibia, osteomyelitis (OM), tibial dyschondroplasia (TDC), spondylolisthesis, “Shaky Leg”, etc. The year 2017 was particularly noted increased incidence of valgus and varus leg deformities across much of the US industry due to undetermined etiology; the issue contributed to increased mortality in affected flocks. Heat stress ranked #26 following a moderate summer, compared to #18 the prior year. 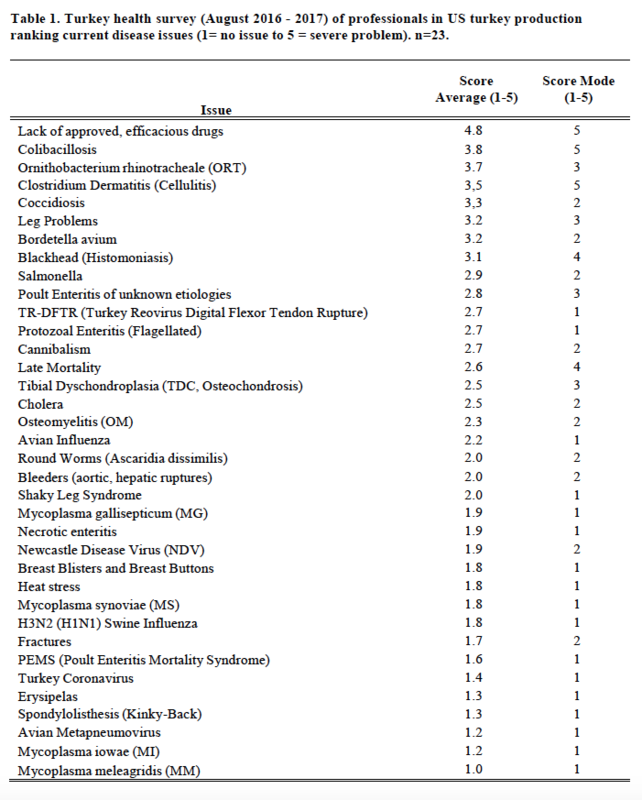 Poult Enteritis Mortality Syndrome (PEMS) ranked #30 versus #29 previously. Avian Metapneumovirus (AmPV) ranked #34 versus #33, with a few atypical cases limited to the Midwestern US. Bordetella avium continued as a significant respiratory disease challenge in several geographic regions; bordetellosis ranked #7 compared to #8 the prior year. Mycoplasma synoviae (MS, infectious synovitis) infections, ranked #27 (#27, prior year), are one cause of synovitis. It may be present in flocks 10-12 weeks of age with typically low mortality and low morbidity. There were 33 cases of MS reported (Table 2). The primary breeders have remained free of M. gallisepticum (MG), M. meleagridis (MM) and MS. Sporadic, but increasingly frequent infections with Mycoplasma, both MG and MS, often in association with backyard poultry and broiler breeder flocks is an ongoing concern, having the greatest impact when a breeder flock is infected and has to be destroyed. There were 52 cases of MG reported (Table 2). Twenty of twenty-three participants responded to rank the shortage of veterinarians trained in the diagnosis and treatment of diseases, and welfare of turkeys. The issue ranked 2.9 and ranged from 1 to 5 (1= no issue to 5 = severe problem). It is duly noted that most post-DVM poultry medicine training programs have little to no exposure to the turkey industry. Threat of the reoccurrence of Highly Pathogenic Avian Influenza (HPAI) continues to be a focus for the industry. Thankfully, prevention, detection and response for the virus has greatly improved since the devastating 2015 outbreak. During that outbreak, both H5N8 and H5N2 strains of HPAI affected turkey flocks in eight states, with H5N2 accounting for the majority of cases. In total, 153 farms commercial turkey or turkey breeder flocks were infected, resulting in the loss of over 7.75 million turkeys, in addition to over 40 million chickens (layers and broiler breeders). To date, USDA has classified this outbreak as the worst incident of animal disease in U.S. history. In March, 2017, industry efforts prevailed as the HPAI virus was contained in Lincoln County, Tennessee. The North American wild bird lineage H7N9—not to be confused with the China H7N9 virus that impacted poultry and humans in Asia—was detected on two commercial broiler breeder farms in Lincoln County. The industry worked closely with Tennessee’s State Board of Animal Health, Tennessee’s State Veterinarian, USDA’s Animal and Plant Health Inspection Service (APHIS) and National Veterinary Services Laboratory (NVSL) to rapidly confirm, report and respond to these cases, as well as depopulate infected flocks. In combination to the two HPAI cases, subsequent cases of Low Pathogenic Avian Influenza (LPAI) were also reported beginning in March throughout south central Tennessee, northern Alabama, southern Kentucky and western Georgia. Six commercial broiler breeder operations and six backyard flocks were found positive with notifiable H7 or H7N9 LPAI. In total, approximately 253,000 birds died from disease or were depopulated to control the combined LPAI and HPAI incidents. 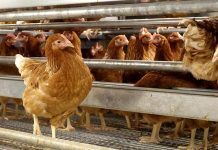 Epidemiologic, genetic and wildlife investigations surrounding the outbreaks continue in order to provide a better understanding of factors associated with avian influenza virus transmission and its introduction into poultry flocks. In addition to HPAI, the turkey industry has been faced with numerous turkey health issues last year. As previously mentioned in the report, Turkey Arthritis Reovirus (TARV) and other leg issues have become an industry-wide concern throughout the 2016-2017 production year. In May, 2017, The National Turkey Federation distributed a Turkey Leg Health Survey to assess the need for research, the regional trends and the economic impacts of TARV on the industry. The survey results were shared with industry members at numerous turkey-specific meetings. Moving forward, it was determined by key industry veterinarians and professionals that an additional survey be created to better evaluate TARV and other turkey-specific leg health issues as it related to U.S. and global turkey production. Aside from leg issues and TARV, Blackhead has had a significant prevalence this year in turkey flocks across the country. The Secure Turkey Supply (STS) Plan is undergoing additional updates by industry members (www.secureturkeysupply.com). STS includes Federal and State Transport (FAST) Plan for Movement of Commercial Turkeys in a High Pathogenicity Avian Influenza (HPAI) Control Area, and Turkey Risk Assessment. Permit guidance for Turkey Hatching Eggs, Day-old Poults and Turkeys to Market were updated as of May, 2017. These guidance documents are the operational component of the more detailed science-based risk assessments. The current versions of the STS Plan continue to be utilized in regions affected by HPAI and LPAI, and have been instrumental keeping the movement and shipping of turkeys and turkey products underway. The purpose of putting the STS Plan in place is to facilitate business continuity and economic survival of participating non-infected turkey operations in a Control Area after a detection of HPAI, and to help make certain that that a continuous supply of safe turkey meat is available to consumers. The health of turkeys remains to be of utmost importance to the industry. The ability to utilize approved, efficacious drugs, in a judicious manner has been heavily stressed in all aspects of the industry, especially considering the heightened amount of conversations and questions surrounding antibiotic resistance. The ability to control and prevent animal disease and/or treat those that are sick is critical to any animal’s wellbeing. Increased outside pressure to reduce and even eliminate the use of antimicrobial drug use in animals continues, which poses a large threat to the industry in the case of a bacterial disease outbreak, similar to that of a viral disease outbreak (i.e. Avian Influenza). The industry has been workin g tirelessly in the realm of product innovation and research to reduce any consequences that could result from such an outbreak. NTF continues conversations with other protein associations to ensure that agency and practices and implementations align with the industry. – Final Guidance #152, “Evaluating the Safety of Antimicrobial New Animal Drugs with Regard to their Microbiological Effects on Bacteria of Human Health Concern”: The first animal related guidance, in regards to drug utilization, published in 2003. – Guidance for Industry (GFI) #209 “The Judicious Use of Medically Important Antimicrobial Drugs in Food-Producing Animals“: A GFI written to reduce and eliminate the use of antibiotics for the sole purpose of growth promotion, published in 2012. – Guidance #213,“New Animal Drugs and New Animal Drug Combination Products Administered in or on Medicated Feed or Drinking Water of Food Producing Animals: Recommendations for Drug Sponsors for Voluntarily Aligning Product Use Conditions with GFI #209”: A guidance that detailed how FDA expected to implement guidance #209, published in 2013. – Veterinary Feed Directive (VFD): A directive that established the rules and responsibilities for licensed veterinarians in prescribing and administering medically important antimicrobials in animal feed, published in 2015. The National Turkey Federation supported the guidance documents listed above even though they questioned the underlying science indicating a direct link between animal use of antibiotics and human antibiotic resistance. Guidance #213 established procedures for phasing out the use of medically important antimicrobials for production purposes in alignment with Guidance for Industry #209 and proposed changes to VFD drug regulations. Final implementation of all changes took effect December 2016 and no drugs listed as “medically important” that are exclusively labeled for production purposes can be used moving forward. On January 1, 2017, the change from over-the-counter (OTC) to prescription (Rx) status for drugs administered through drinking water or to VFD for drugs administered in medicated feeds went into effect. Drug sponsors were expected to complete the necessary label changes of their affected products and distributors or retail establishments that handle these products were required to meet all applicable State and Federal regulations for Rx and VFD drugs when dispensing these products. Changes in drug use practices are now being discussed by FDA and industry groups. In an attempt to collaborate and address antibiotic resistance from the national level with the Presidential Administration and with USDA agencies, the Presidential Advisory Council run by Health & Human Services (HHS) in consultation with the Department of Defense, was established in 2015. The Obama-era White House released a National Action Plan to ultimately achieve (by the implementation date in the year 2020) five goals laid out by the Administration. USDA’s Food Safety Inspection Service (FSIS), Agricultural Research Service (ARS) and Animal and Plant Health Inspection Service (APHIS) continue to work with FDA/CVM to collect better data to inform these goals as each year passes. Discussions surrounding what data should be collected and exactly how the data will be collected have been continuing at the industry level. In May, 2017, the Presidential Advisory Council on Combating Antibiotic-Resistant Bacteria (PACCARB) held its 6th public meeting which was dedicated to the topic of infection prevention and control as it relates to animal health. It was emphasized that limiting the judicious use of antibiotics could have a negative impact on animal welfare, and as such, should not be the sole focus of the effort. Additionally, a key theme expressed in both human and animal health, was the need for funding to incentivize and support the approval of alternatives. In the international domain, the World Health Organization’s (WHO) Global Action Plan (GAP) was endorsed in 2015 as a cross-sectoral approach to address antimicrobial resistance (AMR). Political leaders in the United Nations General Assembly further endorsed the plan in September 2016. As a reminder, the GAP sets out responsibilities for national governments, for the World Organization for Animal Health (OIE), Food and Agriculture Organization (FAO), and WHO, and for other national and international partners involved in the global response to AMR. To ensure action is being taken, and to assess whether those actions are having the intended results the “One Health” tripartite organizations – WHO, FAO and OIE – have come together to develop a proposed approach for the Monitoring and Evaluation of the GAP. The proposal includes reporting back to the global health community, including the governing bodies of WHO, FAO and OIE, and the Interagency Coordination Group (IACG) on AMR that was established by the UN General Assembly. Currently, a web-based consultation has been posted by the WHO to seek feedback from Member Countries and other stakeholders, including human health, animal health, plant health and environmental health sectors, with comments due the end of September, 2017. NTF is working in various coalitions to ensure the turkey industry perspective is included. Working on the congressional front, NTF, along with many other key groups and associations, pioneered the Animal Pest and Disease Prevention Program (APAD) with the hopes of its inclusion in the 2014 Farm Bill. The program was modeled after the Plant Pest and Disease Management and Disaster Prevention Program and will revolutionize animal disease prevention and response. Mandatory funding for the program will ensure the sufficient development and timely deployment of all tools to prevent, identify and mitigate animal disease outbreaks and to limit the impacts of foreign diseases on American livestock and poultry producers. In 2016, turkey production increased to 7,486,978,000 from 7,038,136,000 pounds (live weight). Overall, domestic per capita consumption for turkey products increased from 16.00 in 2015 to 16.50 in 2016, which is the highest level since 2010. Live production in 2016 increased to 244,000,000 head with an average live weight of 30.35 lbs. In 2015, 233,100,000 head were produced with an average live weight of 30.19 lbs. (Reference: National Turkey Federation Sourcebook, pending publication October 2017).